The JAK inhibitor (JAKi) ruxolitinib is standard treatment for myelofibrosis (MF), but some patients are unresponsive. Pre-clinical and clinical data suggest that addition of a Hedgehog pathway inhibitor (HPI) to ruxolitinib might improve response. Vismodegib is an HPI approved for treatment of locally advanced and metastatic basal cell carcinoma. The MYLIE study assessed the safety and efficacy of combining ruxolitinib with vismodegib in ruxolitinib-naive patients with MF and characterized the pharmacokinetics (PK) of vismodegib in this setting. In this phase Ib study, ten patients with intermediate- or high-risk primary or secondary MF received open-label vismodegib (150 mg/day orally) and ruxolitinib (15 or 20 mg orally twice daily, depending on baseline platelet count) for up to 48 weeks, or until withdrawal or discontinuation. PK samples were collected throughout the study for comparison with other patient populations. Efficacy outcomes at week 24 included spleen response (≥ 35% reduction in volume by imaging) and improvement in bone marrow fibrosis by central and investigator assessment, symptom response (≥ 50% reduction in Myeloproliferative Neoplasm Symptom Assessment Form Total Symptom score), and anemia response (per International Working Group for Myeloproliferative Neoplasms Research and Treatment revised response criteria). As of November 17, 2017, eight patients had completed 48 weeks of treatment with vismodegib and ruxolitinib; two discontinued treatment early. At week 24 (± 1 week), three patients experienced a spleen response by central review and no patients showed a 1-grade improvement in bone marrow fibrosis by central review. Five patients experienced symptom response at week 24, and no patients experienced an anemia response. The most common adverse events were muscle spasm (100% of patients), alopecia (70%), dysgeusia (50%), thrombocytopenia (50%), and nausea (40%); these events were predominantly grade 1/2. Three patients experienced a total of six serious adverse events. The combination of vismodegib and ruxolitinib was tolerable and no new safety signals were seen, but there was no evidence that the addition of vismodegib to ruxolitinib improved any of the efficacy outcome measures assessed. Further evaluation of this combination will not be pursued. ClinicalTrials.gov, NCT02593760. Registered November 2, 2015. The JAK inhibitor (JAKi) ruxolitinib is standard treatment for intermediate- or high-risk myelofibrosis (MF), but fewer than 50% of patients achieve spleen response (≥ 35% reduction in spleen volume) or significant improvement in symptom burden [1, 2]. The Hedgehog signaling pathway is involved in primitive and definitive bone marrow hematopoiesis and maintenance of hematopoietic precursors . Pre-clinical and clinical data suggest that addition of a Hedgehog pathway inhibitor (HPI) to ruxolitinib may improve response [4, 6]. The HPI vismodegib is approved for the treatment of advanced basal cell carcinoma . We present findings from MYLIE, an open-label, multi-center, phase Ib study (ClinicalTrials.gov, NCT02593760) of vismodegib plus ruxolitinib in patients with intermediate- or high-risk MF. Eligible patients were adults with pathologically confirmed primary MF, post-polycythemia vera MF, or post-essential thrombocythemia MF who were considered intermediate-1, intermediate-2, or high risk, with a peripheral blood blast count < 10% and palpable splenomegaly > 5 cm below the left costal margin, and who had no prior treatment with a JAKi or an HPI. Patients received vismodegib (150 mg/day orally) and ruxolitinib (starting dose 15 or 20 mg orally twice daily, depending on baseline platelet count) for up to 48 weeks, or until disease progression, unacceptable toxicity, or consent withdrawal. Efficacy end points were assessed at 24 and 48 weeks after the first dose of study medication and included spleen response rate (≥ 35% reduction in spleen volume), disease response rate (complete remission [CR] and partial remission [PR]), clinical improvement (anemia, spleen, or symptom response without disease progression or increase in severity of anemia, thrombocytopenia, or neutropenia), anemia response rate, and improvement in bone marrow fibrosis of ≥ 1 grade (Additional file 1). Pharmacokinetics of total and unbound vismodegib were characterized using pre-dose samples obtained at weeks 6, 12, 24, 36, and 48 and were compared with data from patients with advanced basal cell carcinoma [7–9]. Ten patients were enrolled at four sites in the USA (2), Canada (1), and Italy (1) (Table 1). Patients received vismodegib plus ruxolitinib for a median of 330.0 days. Eight patients completed 48 weeks of treatment; one patient discontinued owing to lack of efficacy at 35 weeks and one because of a vismodegib-related adverse event (AE; dysgeusia) at 23 weeks. At week 24, spleen response was observed in one and three patients by investigator and central review, respectively (Fig. 1a). At week 48, of eight patients, two and four patients had spleen response by investigator and central review, respectively. Of seven evaluable patients, five had symptom response at week 24 (Fig. 1b). 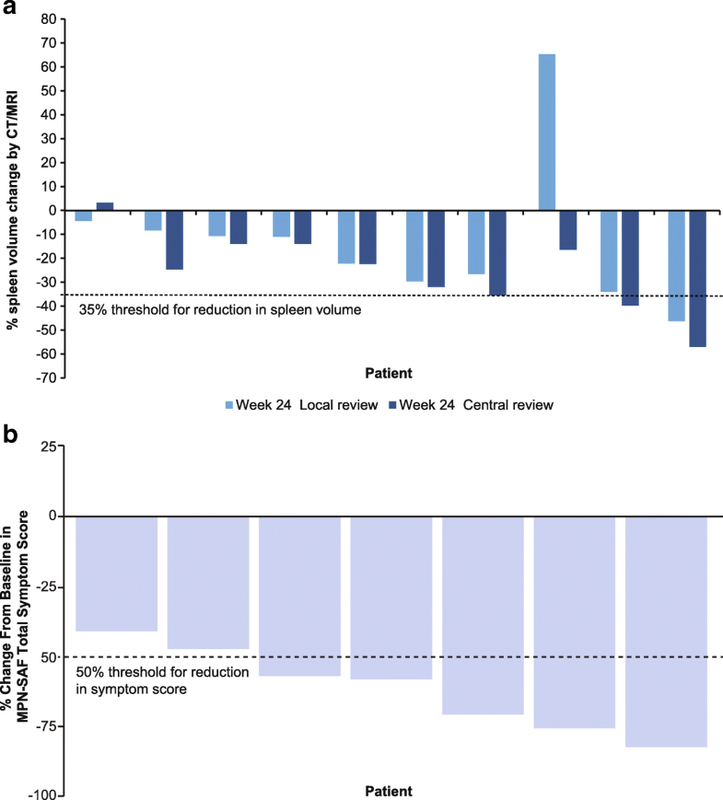 At week 48, symptom response was achieved in two patients with no previous symptom response, three patients maintained symptom response from week 24, and two were not evaluable. No patients experienced anemia response. Of nine patients evaluable for disease response at week 24, one experienced PR, one experienced clinical improvement, and seven had stable disease. Of eight patients on study at week 48, one maintained clinical improvement, six had stable disease, and the patient with PR had relapsed. From baseline, no patients experienced a ≥ 1-grade improvement in fibrosis at week 24 per central review (Additional file 1: Table S1). Of five patients with bone marrow biopsy specimens at week 48, a 1-grade improvement in fibrosis was observed in one and two patients by central review and local pathology review, respectively. All ten patients experienced at least one AE (Additional file 1: Table S2): five patients (50%) experienced grade ≥ 3 AEs, and three patients (30%) experienced a total of six serious AEs (grade 4 anemia, grade 3 pneumonia, grade 4 sepsis, grade 3 vomiting, grade 3 lung infiltration, grade 3 infectious enterocolitis). No patients died during the study period. Dose interruptions or modifications are shown in Additional file 1: Table S3. Total and unbound steady-state vismodegib plasma concentrations in patients with MF were consistent with those obtained in patients with basal cell carcinoma (Additional file 1: Table S4) [7, 8]. Vismodegib combined with ruxolitinib did not result in greater efficacy than ruxolitinib alone , consistent with other trials of HPIs in MF [6, 10]. The combination was tolerable, and no new safety signals were seen. However, because of lack of evidence of a disease-modifying effect after addition of vismodegib to ruxolitinib, further evaluation of this combination will not be pursued. Third-party medical writing support was provided by Lucy Smithers, PhD (ApotheCom, London, UK) and was funded by F. Hoffmann-La Roche Ltd. The authors thank the participating investigators and patients. This study was funded by F. Hoffmann-La Roche Ltd. The trial was designed by the sponsor (F. Hoffmann-La Roche Ltd). Data were collected by the site investigators and were retained and analyzed by the sponsor (F. Hoffmann-La Roche Ltd). All authors had full access to the data. FP was supported by grants of the Fondazione Regionale Ricerca Biomedica, Milan, Italy [FRRB project no. 2015-0042: genomic profiling of rare hematologic malignancies, development of personalized medicine strategies, and their implementation into the Rete Ematologica Lombarda (REL) clinical network]. SC, GB, WD, JC, SK, SV, GH, CH, ND, and FP interpreted the study data and contributed to writing the manuscript. MT, ND, and VM performed the data analyses. All authors read and approved the final manuscript. This study was conducted in full conformance with the ICH E6 Guideline for Good Clinical Practice and the principles of the Declaration of Helsinki. It was approved by the institutional review boards or ethics committees of the study sites. GH, CH, MT, and ND are employees of F. Hoffman-La Roche Ltd., and ND holds stock in F. Hoffman-La Roche Ltd. VM is an employee of Roche-Genentech, Ltd. SK reports receiving honoraria for advisory board participation, travel expenses, and research funding by Novartis, in addition to the funding of this study by F. Hoffmann-LaRoche Ltd. JC, SC, GB, WD, SV, and FP declare that they have no competing interests other than the funding of this study by F. Hoffmann-LaRoche Ltd.